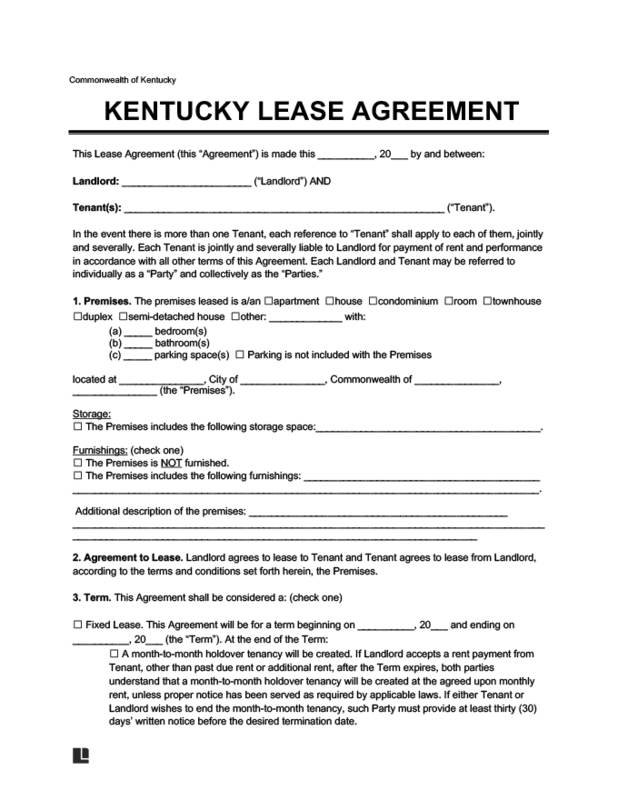 Use our attorney-drafted KY Lease Agreement form to finalize the renting out of your house, apartment, condo, basement or attic. Rent payment specifics, such as a payment schedule and payment methods. Keep in mind, states won’t always have identical rental and leasing requirements, and will likely differ on some key issues. It’s important for you to acquaint yourself with your state’s specific differences and requirements in order to best protect your financial and legal renting future. For example, some states may impose strict notice requirements on landlords before entering a tenant’s home, while others may allow for entry at any time and without notice. Additionally, landlords may be required to disclose certain things, such as whether the property was exposed to asbestos, or if it was used as a meth lab. Security deposits must be kept in a separate security deposit bank account, and tenants shall be informed of where the separate account is located and any relevant account numbers. Should a landlord fail to provide a tenant with this information, they will not be able to retain any portion of the security deposit.